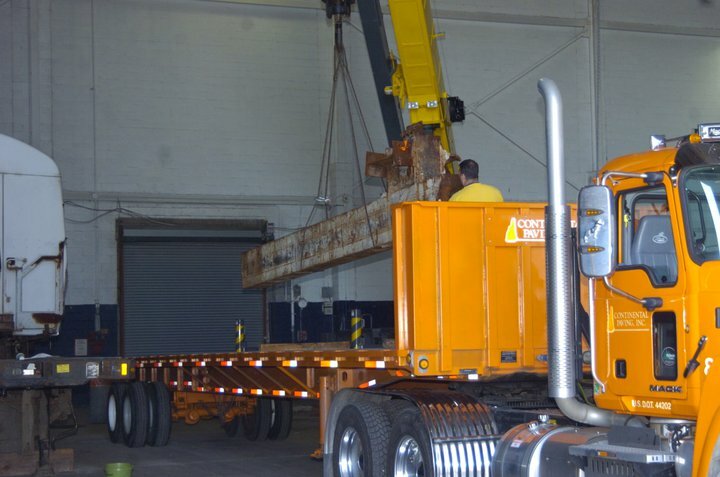 At 2:00 a.m. on May 12, 2011, a flatbed truck and driving team, gathered in Hudson, New Hampshire. Hudson's Continental Paving volunteered the truck and crew to make its way to New York. In New York Hudson fire captain Dave Morin and several others arrived at hanger 17 at JFK airport. during the visit, they viewed many other artifacts from the attack. Morin said that seeing the cars, trucks, and other vehicles crushed "... really put in perspective the project [we] were undertaking." Hudson Selectman Roger Coutu said, "It was heart wrenching to see all the destruction. We arrived excited and left respectfully somber." Hudson Animal Control Officer Carol Whiting added, "It made you realize the mass destruction of that day. It gave us such a different feeling."